Our family spent Thanksgiving week in Rwanda. I gathered images in my journal, and now I spill them here. Because there are so many stories worth telling in this world, and I feel like we had our tank filled to overflowing. Twenty-four hours of travel, across the wide ocean, we stepped off the plane Saturday night, bleary and excited, eager to see Rebeka for the first time. She would spend the night with us until Thursday, five nights of sleepovers, sharing a bed with Alayna at the guest house, sharing meals with our team of thirty Texans. This trip wasn’t just about Rebeka, but she’s where it all started, at the airport, hugging her familiar neck. 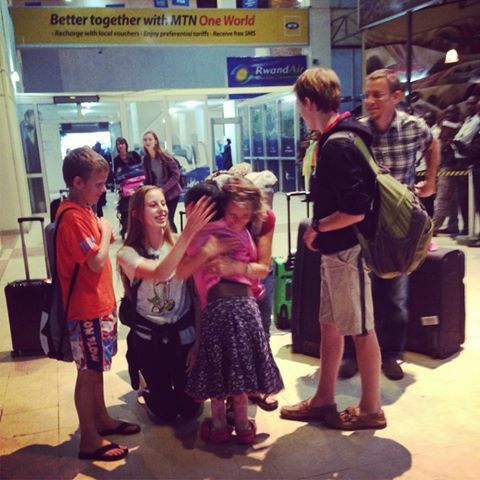 Seeing Rebeka in the Kigali airport. It was our third time to Rwanda. We would visit all of our sponsored kids over the week, seeing some for the third time, tracing their growth through six years of pictures, delighting in small changes and slowly growing, long-distance friendships. That first night we fell into bed, and woke to Rwanda. Misty morning, bird tapping on the window, soldiers running past outside, chanting. We stumbled into the day, wide-eyed. 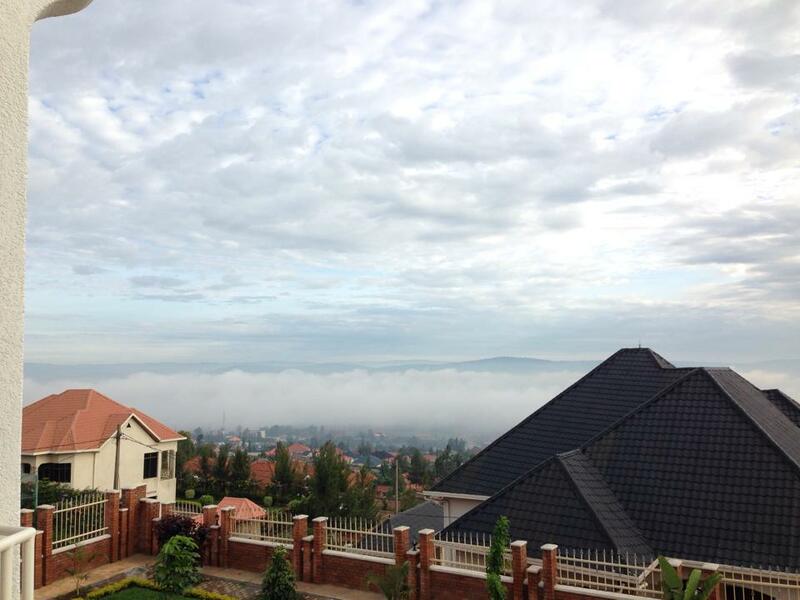 We ate breakfast as we gazed at the capital city of Kigali, spreading down the hillside in front of us, cupped by some of the “thousand hills” Rwanda is so famous for. View from the back porch of the guest house. Breakfast was warm bread and sliced bananas. We drank water from a bottle, careful not to ever drink from the tap. Then the team loaded up and took a bus an hour south down bumpy red roads to Bugesera for Sunday morning church service. As the world slipped past I saw and remembered. People walking, everywhere, hundreds of them. Crazy motorcycles, perilous traffic, and then into the country. Dusty, smiling children and lush, green hillsides. Mud homes with metal doors, or curtains for doors, or sometimes no door at all. Cassava drying on a blanket outside, chicken pecking at it. Small children carrying big yellow cans, fetching water. 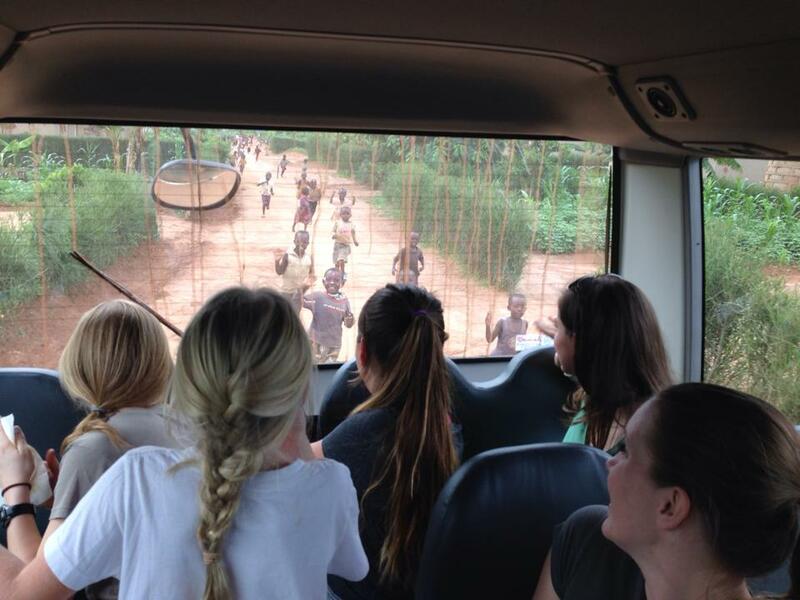 Children chasing our bus, calling “muzungu” (white person!) and waving hard. 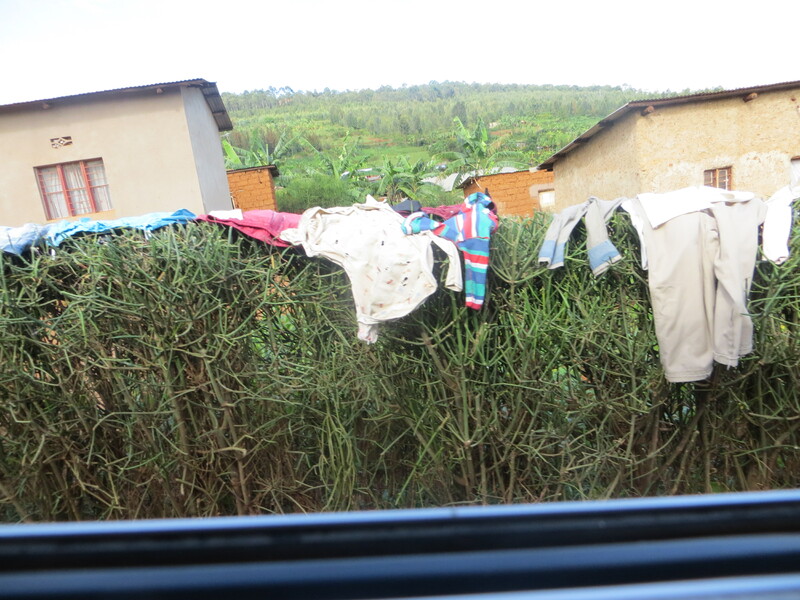 Women washed clothes in plastic tubs and hung laundry on bushes. Cows with long, dangerous horns, walked gentle down the road. A baby crawled two feet from our passing wheels, women walked with huge bundles on their heads, men pushed bikes up hills, loaded high with bananas or water cans. Clothes tied on sticks were scattered in the fields to scare birds from the maize. 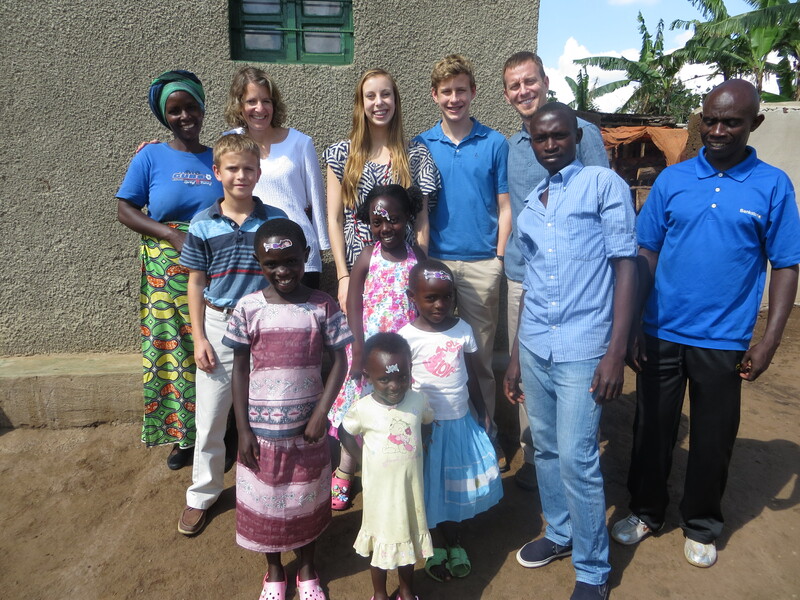 Rebeka’s sister Esperanza was at the church service in Bugesera, though we didn’t know it until after. She came, shy and curious, once it was all over (the two hours of dancing and singing and murmured prayers in a foreign tongue all around us, hands held high, two sermons, delivered passionate, translated for us). Esperanza hugged us, smiling, and sat quietly, sharing our lunch, trying popcorn for the first time. Rebeka translated for her big sister, proud and comfortable. Then we were in a van, bouncing down a red dirt road. We stopped to pick up two women dressed in bright church clothes and gave them a lift, three or four miles down the road. From the backseat, Rebeka said, “My dad!” pointing at a thin man walking down the road, wearing a blue shirt. We stopped and picked him up, too, and he squeezed into the front seat. He was all big smiles and shaking hands and then we were off again. Rebeka’s dad chatted with the driver, Clay told me later he had already been to the lake near their house to catch fish, walked six miles to the road to catch a ride to the capital, took an hour there and back to sell his fish, and was walking home again. It wasn’t one o’clock yet. Had he fished in the dark? When we arrived I recognized her house from the pictures, beautiful lake shining on the right, house up a small hill on the left, and neighbor children already gathering to witness the spectacle of muzungus arriving in their van. The first thing I saw when we stepped into the house was the pink dog. When Rebeka first arrived in America a sweet little neighbor girl started bringing presents. Little bags with treats. The small, stuffed pink dog with giant eyes arrived on day two, and Rebeka kept it faithfully clipped to her shorts for weeks. Now here it was, hanging from her ceiling, along with paper snowflakes and a few other assorted toys. As we sat on either side of a small coffee table, and the translator helped us talk to each other, my eyes kept straying to the ceiling. That dog, those snowflakes, they told so much about this family. 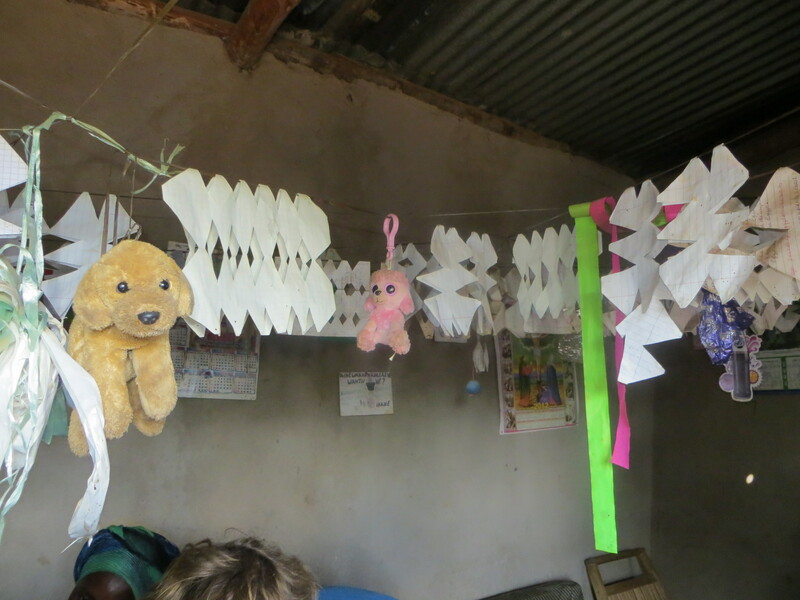 I have never been in a sponsored kid’s home that was decorated this way. There may be a calendar picture tacked to the wall, maybe a faded picture of the sponsor family, sent across the ocean, but this was special. This spoke of a mother who gave freedom to her children to express themselves. It was a reach beyond fetching water, washing clothes, cooking meals, and all the basic survival tasks that occupy their days. It spoke of creativity and imagination and the desire to make things pretty no matter what the raw materials. I hope if I had a small house made of mud in Rwanda, there would be snowflakes hanging from the ceiling. 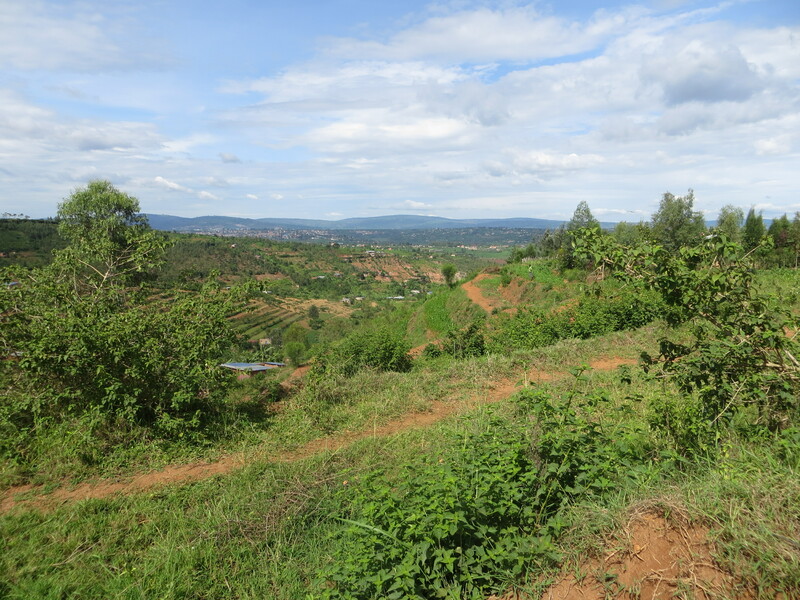 We would spend seven full days in Rwanda, seven days worth of stories we encountered on those red, dirt streets, but I wanted to start with this one. This hastily sketched picture of what it looks like, what it feels like, to be in this country. And what it was like that first day, meeting Rebeka’s family and seeing that little pink dog. Rebeka’s family, three younger sisters, a brother, and mom and dad. Her older sisters aren’t pictured here. Thanks for continuing to share your stories. You write so vividly, between your writing and pictures, I can “see” so much. I love that rebeka’s mom encourages that precious imagination! It’s wonderful to hear your perspective on all you experience. It gives those of us who have never experienced anything like this a taste of what it is like. 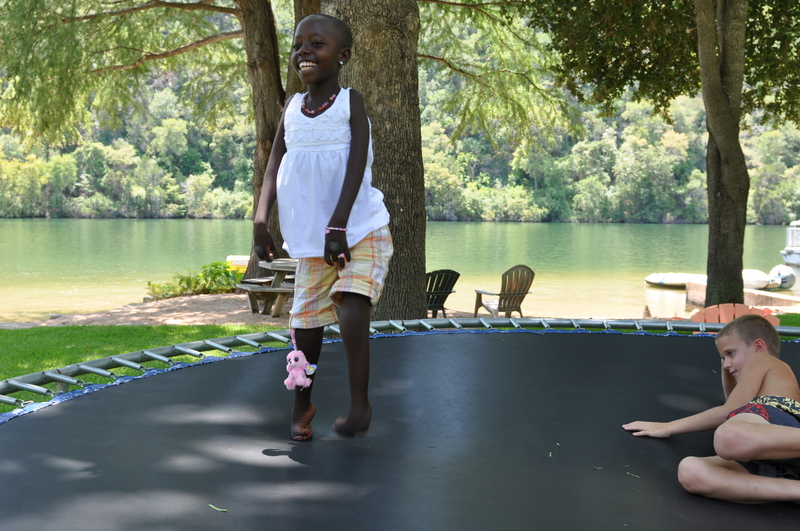 I love hearing about the joy they have in such an impoverished society….much to learn from that. Thanks so much for forwarding. Thank you Meredith. Unwanted to hear more. 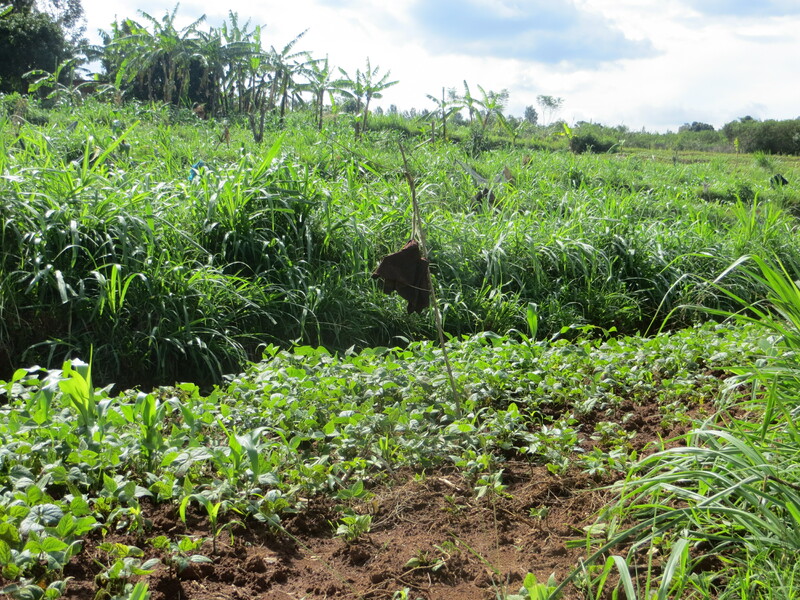 Please keep writing about the trip and Rwanda and its dear people! Sorry… I want to hear more! Oh, thank you for sharing news of your trip and Rebekah. I look forward to more words and pictures. I love the love in this post.